Because I wanted a time-travel game that lets you do things other time-travel games won't. Play events out of sequence, meet yourself, be in two places at once, alter scenes already in play, solve problems before they happen, cheat death. As a time traveler you can go anywhere and anywhen in time and space. Visit ancient battlefields, lost civilizations, modern cities, and future space colonies. Fight robots, dinosaurs, aliens, time bandits, and Grey Goo. But that's not all. Travel back into scenes that have already been played. Alter history, meet yourself, be in two places at once, and cheat death. Call on your past or future self to help you. Meet the other characters before they have met you. Solve mysteries before they happen... and try not to get caught in your own Paradoxes. Because time travelers can do anything... except resist the temptation to Bend time too far. 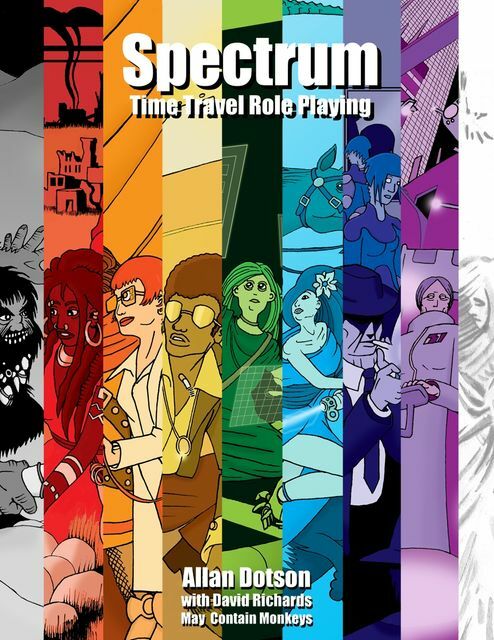 Spectrum is a complete role-playing game of time travel adventure for experienced gamers.